Address15th Floor, B tower Liuying commercial building, Xinhua road,Shijiazhuang city,Hebei province, China. 1. High structural strength, made from heavy-duty insulation aluminum panel and extrusion, can be used as a independent unit. 2. Small size, light weight, easy to hide, configured with plug and play power outlets,internet access, air conditioners. working conditions are comfortable. 5. Main materials: carbon fiber, glass fiber, aramid honeycomb and aluminum honeycomb, shielding material, etc. 6. High load to weight ratio and suitable for mini systems with high mobility. 7. Other functions such as automatic balance system, automatic shelter lifting system, internal control system, etc can be integrated according to customer requirements to meet various customer needs. 8. Mode: single-side expansion, double-side expansion, multiple expansion. 9. Expanding way: withdrawal, overturn. 10. Transmission: by power, by hand, by fluid. 1. By withdrawal or overturn, you can combine more shelters to get more space and function. 2. The smart designed connecting parts fixed on the wall can help you to combine the shelters easily, even you can get a house with courtyard as you wish. 3. Applicable to: field command post, hospital, temporary hangar, VIP lounge, etc. 4. A mini shelter tailored for customer with special purpose is usually mounted on small four-wheel vehicles. 5. It is suitable for temporary command center of a small unit , mobile communication and detection nodes, etc. 1. High shielding effectiveness body: within the frequency range of 0.01 ~ 18000MHz, the shielding effectiveness is not less than 60dB. 2. In the 0.01 ~ 18000MHz frequency range, the shielding efficiency can reach up to 80dB or more. 1. The plate can bear the 1KN ~10KN load as point load, concentrated load and uniform load. 2. Reinforcement for the inside equipments is available depend on buyers desire. 3. Crane lifting or helicopter hoisting is available. 1. With internal protection and external protection, draping protection and other ways for protection. 2. Bullet-proof treatment of key parts such as cab, chassis oil / gas road, windows, member positions and so on. 3. It is suitable for mobile command post, important electronic equipment carrier, mine lifesaving and other fields. 1. Airtight: Up to 300Pa over pressure, the air leakage will be 0.1 ~ 6 m3/min inside the shelter. 2. Light: anti direct light leak out of the shelter. 4. Water seal：endure the 6mm/min rain last 1 hour time. 1. All kinds of anti infrared and visible camouflage paint (Southern Woodland Camouflage, digital camouflage, etc.) 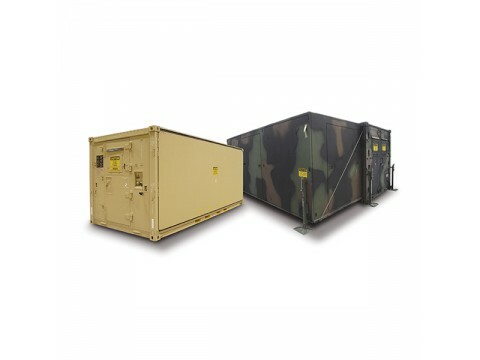 are coated on the surface of the shelter with visible camouflage and near infrared camouflage capability. 2. The body structure electromagnetic shielding was treated, the electromagnetic leakage was reduced. 3. Radar wave stealth coating was coated on outside surface of the shelter or the installed radar wave absorbing materials to reduce the locking possibility by space-based / ground-based radar and to evade the attack from the guided weapons. 2. It has the functions against solar radiation, earthquake impact, damp heat, mould, salt spray, sand and dust.